When Patrick (not his real name) accepted a job as a part-time Harvard researcher in early 2017, he was enthusiastic. Fresh off a stint as a consultant, he said he felt excited to switch professional gears. Though his new job did not pay as well as the old, Patrick’s boss said he could expect a promotion to a full-time position in two or three months. Patrick told himself the wait was worth it — he thought it was “obvious” that Harvard would be “a great place to work,” he recalled in an interview last week. What Patrick did not foresee was that he would soon burn through his savings while remaining employed on a part-time basis for 15 months. During that time, he said he often worked beyond the maximum 17.5 hours that a “less than half time” worker — his official designation at the school — is permitted to put in per week under Harvard policies. Patrick went unpaid for the extra time. And he went without the benefits afforded to full-time colleagues putting in similar hours, including employer-provided healthcare and retirement contributions. Patrick spoke only on the condition of anonymity for fear of retaliation from higher-ups at Harvard. Hundreds of part-time workers at Harvard suffered a fate similar to Patrick’s last year, according to a 2018 analysis of University employment data conducted by the Harvard Union of Clerical and Technical Workers, the school’s largest labor union. Part-time workers at Harvard are supposed to obey specific, school-established limits on how often and for how long they can work. In its analysis, the union wrote Harvard is relying on “loopholes” and “policy work-arounds” to eke out an unjustifiable amount of uncompensated work from its supposedly part-time staff. Asked about the status of the 291 employees, University spokesperson Melodie L. Jackson did not challenge the validity of the union’s analysis. She wrote in an emailed statement that the University does not believe the phenomenon is a widespread problem. She added that Harvard could have done a better job clarifying its policies. Part-time workers in Cambridge fall into two main categories: less-than-half time (commonly referred to as “LHTs”) and temporary employees, known as “temps.” The positions are non-unionized. The University hires individuals in these categories to fill short-term and low-hours positions. Per Harvard policy, temps may be employed by the University for no more than 90 days, and LHTs must work less than 17.5 hours per week. Under HUCTW’s most recent contract with Harvard, settled in 2015 and expired in Sept. 2018, the University and the union agreed that Harvard should only hire temps and LHTs during work or staffing shortages. HUCTW, a catch-all union, represents clerical and technical workers as well as librarians, lab technicians, and staff assistants. “It is a fundamental ideal of the Harvard workplace that, although temporary (Temp) or less than half-time (LHT) staffing is a necessary employment vehicle at Harvard, the use of Temp and LHT workers should be exceptional and strictly limited, and never at the expense of regular benefitted employment,” the contract reads. But, according to the union’s 2018 analysis of Harvard employment data — derived from a more than 50,000-row spreadsheet Harvard was forced to provide during contract negotiations — the number of temps and LHTs employed by the University has increased by 11 percent over the past three years. During the 2017 fiscal year alone, over 4,000 temps and LHTs performed over 920,000 hours of labor for the University — an amount of work equivalent to what 500 “regular, full-time” employees could have produced. Jackson wrote in an emailed statement that many of the details about Harvard’s use of contingent workers reported in HUCTW’s 2018 analysis did not violate the guidelines outlined in the union’s 2015 contract. “Much of what HUCTW has released regarding the use of 'temporary' or 'Less than half time' employees was allowable under the old contract, which both parties agreed to years earlier,” Jackson wrote. 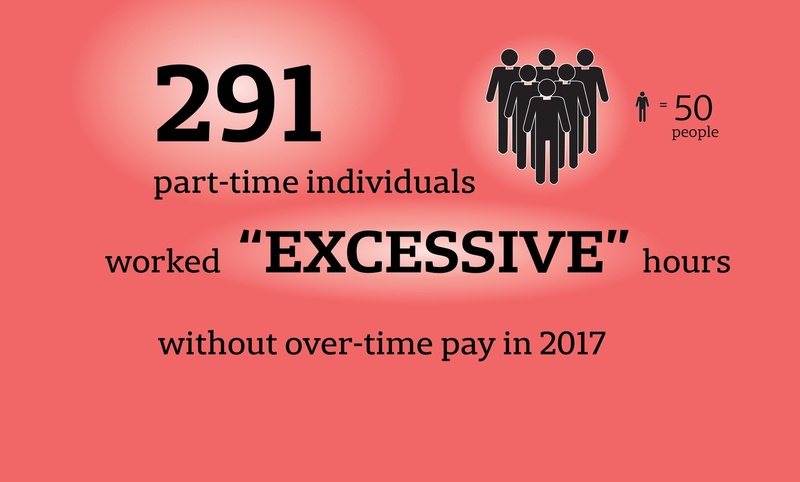 The 291 employees HUCTW alleges were overworked in 2018 put in 17.5 hours per week or more on average over the year, or were temps whom Harvard cycled between LHT and temp status in an apparent attempt to evade the 90-day limit. When the full-time job offer that Patrick had been expecting failed to materialize, he became one of the workers constantly switched between LHT and temp status, he said. He hung on, waiting for a signal that his boss planned to fulfill his promise and bring Patrick on full-time. Patrick said he knows even being able to bear this uncertainty was a privilege. “Most people are not going to be able to stick around for a while, or if they feel that they have no other options, they're going to continue to get strung along, even if the prospects of getting full-time are not great,” he said. “One thing I have noticed about it, at least where I work, is the constant state of precarity,” he added. According to HUCTW Director Bill Jaeger, the problem is widespread, affecting researchers, librarians, and assistants across Harvard’s schools. Jaeger said that the issue as a whole generates “a fair amount of strong feeling” among temps, LHTs, and union members alike. "There's even sort of a moral component in a way,” Jaeger said. “I mean, we would see this as being Harvard's piece of the gig economy problem." "It's just wrong for Harvard to be holding employees in this category where they're really under-benefitted,” he added. When HUCTW negotiators sat down at the bargaining table with Harvard officials last semester, they already knew one of the major items on their agenda: improving the experiences of the school’s part-time workers. "We felt like we have started in recent years to see increasingly aggressive or creative methods in some of the Harvard units for kind of working around those rules, or dancing around them, or frankly, in some cases, just flouting them,” Jaeger said. Both Jaeger and Jackson agreed that, in many cases, the University has a legitimate need to use LHTs and temps — for example, to staff short-term projects or to fill positions with low workloads. “Operating an institution such as Harvard is complex, and this classification of employees provides us with the critical flexibility to meet our obligations to our students, faculty, and staff without interruption each day,” Jackson wrote. In a September interview, HUCTW president Carrie Barbash cited the union’s proposal to reform temp and LHT use as one of three “most critical” policies that could chart the course of negotiations. At the time, she said the two sides’ proposals regarding the use of temps and LHTs were “too far apart” to enable any kind of agreement. "I think attitudes changed over the course of the process,” Jaeger said. “I think we were able to help University administrators understand that there was more of a problem there than they might've thought at the beginning of the process." Under the new policy, LHT employees can work only 14 hours per week. The 2018 contract also includes a provision meant to curb cycling — a worker can only be switched from LHT to temp status, or vice versa, one time in the course of their employment. A joint union-Harvard committee will oversee compliance, and the University must share “comprehensive data” with the union regularly so that members can monitor how many hours LHTs and temps work, as well as the duration of their employment, per the new policy. David Weil, dean of the Heller School for Social Policy and Management at Brandeis University and a former Obama administration labor official, called the contract proposal a “novel” and “innovative” solution to a predicament many employers currently face. He noted the United States economy is increasingly reliant on contingent workers such as temps and LHTs. But Weil noted that the success of the solution is not yet certain. He said it will largely depend on how well the University implements the agreement over time. “You can have beautiful language in a collective bargaining agreement or beautiful language on the books of laws, but it’s really about how well are you able to enforce them, how well can you make them real,” Weil said. Before the policy can take effect, HUCTW’s members must ratify the new contract in a vote slated to take place Dec. 4. If the contract passes, those affected will begin to see the new policy’s effects in March, at the close of a 90-day adjustment period. During the 90 days, schools and departments across the University will have to make a choice: will they convert part-time positions now filled by overworked individuals into full-time jobs? Or will they double down and keep hiring a series of LHTs and temps, sending them packing once the workers reach the more stringent limits of the new policy? “It's kind of pressed the departments a lot harder to decide whether they, whether something is a more significant or longer-term need, and if it is, really the only practical way they can fill it is by hiring people the right way, as regular employees with benefits," Jaeger said. For Rachel — another Harvard part-time worker who, like Patrick, spoke only on the condition of anonymity for fear of retaliation — this tension is personal. But he’s glad a new policy will likely soon take effect. “So I think it makes a lot of sense to limit both the potential for abuse but also the non-malicious attempts,” he added.